It’s a tense week to be an Ottawa Senator, since the question surrounding the Sens isn’t necessarily who is available, but rather: Who will still be there when the dust settles next Monday afternoon? With one week to go until the NHL’s trade deadline on Feb. 26 at 3 p.m. 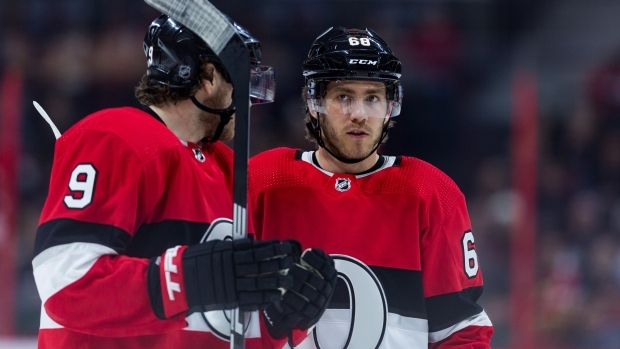 ET, it seems increasingly likely that winger Mike Hoffman will still be a Senator when it’s all said and done. The situation remains fluid, but Hoffman slid to eighth on TSN Hockey’s latest Trade Bait board on Monday, with the latest intel suggesting Senators GM Pierre Dorion is less keen on moving him. It’s Hoffman's lowest ranking on the board in 2018, perhaps in part because of the chemistry he has developed with centre Matt Duchene on Ottawa’s top line – or because offers to date haven't met Dorion's asking price. After all, the Senators spent a boatload – Kyle Turris, first- and third-round picks, plus first-round pick Shane Bowers and goaltender Andrew Hammond ­– to acquire Duchene in November. He’s finally playing up to expectations, thanks in no small part to Hoffman. Since Jan. 5, Duchene has eight goals and 21 points in 19 games. Seventeen of those points came at even strength. In the same 19 games, Hoffman has netted seven goals and 15 points – and has been producing at a point-per-game clip over the last nine contests. Hoffman, 28, is now on track for 23 goals. He has averaged 27 goals over each of the last three seasons. A big part of the value in Hoffman is that he has two more years remaining on his deal at an AAV of $5.2 million. Yes, the Senators are trying to shed salary, as evidenced by last week’s trade of Dion Phaneuf and Nate Thompson to Los Angeles for Marian Gaborik and Nick Shore. Hoffman would be an easy way to do so as one of the premier left wingers on the market. Yet, if making this a one-season blip is the priority for Dorion in Ottawa, hanging on to a high-skill player like Hoffman – whose contract is market value – may be the way to go. Ottawa's Derick Brassard remains the top-ranked centre on the board, while Zack Smith, rental Johnny Oduya – and to a lesser extent, Jean-Gabriel Pageau – remain in play. This week’s list expanded to 45 names. Newcomers include Detroit’s Luke Glendening, Xavier Ouellet and Dan DeKeyser, Pittsburgh’s Matt Hunwick, Buffalo’s Benoit Pouliot and Chicago’s Tommy Wingels. Glendening has drawn interest from the Toronto Maple Leafs, as reported on Friday. Coach Mike Babcock said recently “the people that need to know, know” when asked about his trade wishes. Well, now we know one of them. Glendening, 28, broke into the NHL under Babcock in 2014-15. The idea would be for Glendening to replace oft-scratched centre Dominic Moore on the fourth line. The belief is the Maple Leafs offered a fifth-round pick for Glendening, while the Red Wings countered by asking for a second-round pick. Talks were tabled at that point, with the Leafs unwilling to pay that price. Glendening has three years left on his deal at $1.8 million and the Red Wings are amid a rebuild. Red Wings goaltender Petr Mrazek has also drawn interest from the Philadelphia Flyers. Talks between those two teams have been ongoing for weeks, but heated up again in the last two days when Michal Neuvirth went down at Madison Square Garden on Sunday. Starter Brian Elliott is already out until mid-March after undergoing core muscle surgery. The Detroit Free Press reported the Flyers turned down Mrazek, a pending RFA, in exchange for a third-round pick. It’s unclear whether that price changed after both Neuvirth and Buffalo Sabres netminder Robin Lehner, another potential RFA option, went down with injury. Enjoy this Monday holiday, because next Monday will be hectic.